Millis Transfer, Inc. as we know it today originally started after prohibition with Jake and Ray Millis acquiring the Old Style Distributorship in Black River Falls, Wisconsin. Beer for the wholesale business was hauled from La Crosse, Wisconsin, as well as freight of all kinds to and from La Crosse. In 1944 Bud and Mayo Millis bought out the business from Jake and Ray. In 1972, Millis Brothers Transfer purchased Beer Transit, Inc., of Heartland, Wisconsin. This gave Millis Brothers Transfer Common Carrier authority and additional equipment. In 1980, Millis suffered a great loss when Bud Millis passed away, leaving Bill Millis as sole management leader. Bill continues on today as Chief Executive Officer and majority stockholder of Millis. Millis has grown from 20 tractors and 40 trailers in 1982 to over 700 tractors, 2200 trailers and 100 plus Owner Operators. The training at Millis will last approximately 6 weeks. You will average approximately $625 per week during your training. Training pay at Millis is $.25 cpm. At Millis you will run solo after training. Getting Hired At Millis Transfer, Inc. Minimum Hiring Age For Millis Transfer, Inc. 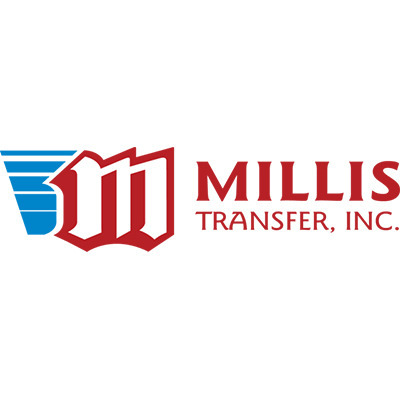 Minimum Experience Required For Millis Transfer, Inc. Drivers with no experience start at 43 cents per mile, increasing by $.01 yearly. Starting wage is also increased $.01 for every year of experience up to 5. Drivers opting for straight pay receive .01 cpm paid quarterly. Referral Bonus: Millis drivers who recruit new drivers to the company will be paid $500 PLUS .o1 cpm for up to one year. Sign on bonus: Drivers will receive $250 bonus after delivery of first load and then at 4 months, 8 months and 12 months drivers receive another $250, totaling $1000. Extra Stop and Pickup: $15.00 For Each Stop After the First Pickup. $15.00 For Each Stop After the First Delivery. Hand Loading / Unloading Less Than 5%: $45.00 to $120.00 depending on weight and load. Layover: $40.00 Per Day After First 24 Hours. Long Island Pay: $100.00 For Any Loads That Pick Up Or Stop Off In New York City Or Long Island. Per Diem pay is optional at Millis, and is $.05 per mile. Drivers accrue 1 year of vacation at 6 months rather than 1 year in the Per Diem pay plan. Millis drivers get three weeks of paid vacation after only one year of service on the per diem plan - 1 week after 6 months, 2 additional weeks after 1 full year of service. Driving Opportunities At Millis Transfer, Inc.
Millis Transfer runs throughout the continental U.S., except for the extreme Northeast. Millis� Home Time Policy shall read that a driver who accumulates 7 days out without a 36 hr at home period will receive a minimum of 36 hours of uninterrupted home time. A driver who accumulates 14 days out without a 36 hr home period will receive a minimum of 72 hrs of uninterrupted home time. A driver who accumulates 21 days or more out without a 36 hr home period will receive a minimum of 108 hrs or 4 � days of uninterrupted home time. Any driver who fails to be allowed the mandated home time earned will be paid at the rate of an additional $.05 per mile for all miles accumulated for days past the home time deadline date. Must be over 10 years old, $18/month or $80/year. Millis does not offer tuition reimbursement. Millis does not allow pets. Military veterans can attend Millis' compony-sponsored school and training program for 1/3 of the original cost. Millis is gradually switching over to all automatic transmissions.